It’s time to go after what you want most in life! If you’re looking to have more in any area, whether it be career, business or personal, we invite you to join the 100-Day Prosperity Challenge. We’ll provide actionable tools to show you how to create what you want, quickly. 1. Clearly define your vision and why you want it. 2. Raise your expectations so they propel you toward your goal. 3. Identify and overcome barriers and self-defeating behaviors. 4. Shift perceptions and internal energy to manifest your desires quickly. 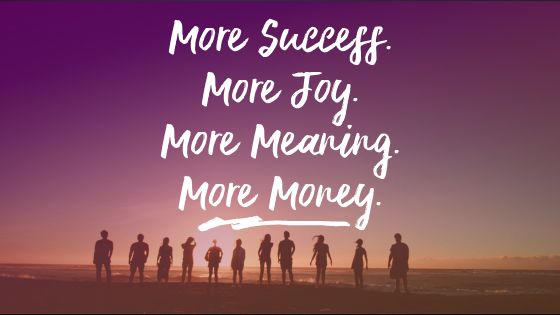 Using our Accelerating Abundance Program, you will receive powerful tools delivered through online training and personal coaching from Succeed On Purpose founder, Terri Maxwell. To join, purchase the Accelerating Abundance Self-Directed Course ($210) and you'll also receive the Small Group Coaching Program at no charge (normally $485). For this challenge we are also giving you a buy-one-get-one-free coupon so you can share the same programs as a gift ($970 value for $210). Step 1: Purchase the Accelerating Abundance Self-Directed Course below. Step 2: Watch for an email to access the Self-Directed course, as well as scheduling the Coaching Groups. Plus, you’ll receive the special code so that you can gift these programs to a friend. Step 3: Share the code with the person you’ve chosen to partner with so that they can purchase Accelerating Abundance at no charge.